Ask fellow campers about "Drifters Resort" and nearby attractions. This RV park has pretty much recovered from Hurricane Harvey storm damage, but the rest of this area leaves much to be desired. The park management are super nice and go out of their way to make sure you are taken care of. The facility is in great shape and they are constantly working to make repairs and upgrades. All the hookups work well (WIFI sometimes slow but better than most RV parks). Sites are level with cement pads and fairly roomy. The roads leading to the sites can be narrow with difficult approaches for larger rigs and need potholes filled. My one complaint about the park is there is no recycling, but after checking around, there is no drop off center except in Corpus Christi! This is none of the park's fault, but the surrounding area is sad and depressing. Marinas and fishing piers are heavily damaged with debris in the water making it unsafe to boat or fish. Many parks are closed, or if open, the rest rooms and facilities are closed. Many businesses will never reopen or have rebuilt and abandoned their old building (a major Texas grocery chain in Rockport). It is very sad and to the outsider, it appears they have lost hope and pride. The debris left behind is the most depressing and lines all the roadways. One of the touristy souvenir shops in Aransas Pass has been abandoned and fenced off (with damaged merchandise strewn everywhere). I doubt any of it has been touched since the storm six months ago! The Rockport/Fulton/Aransas Pass/Aransas Port and surrounding areas are still recovering from Hurricane Harvey. There are debris and eyesores everywhere you drive and look. Street signs are still missing so it is difficult to find your way around. Corpus Christi and Padre Island are beautiful and in pretty good shape. We've been spending most our time there. We camped at Drifters Resort in a Fifth Wheel. Employees are very caring and friendly. Bathrooms are very clean. Pool is awesome. Paved roads and concrete sites. Grounds are very well kept. Great wi-fi and cable. Love staying here. We camped at Drifters Resort in a Fifth Wheel. Friendly, easy check-in for a full hook-up, level, concrete, back-in site. Price listed is for a weeks stay plus electricity. We also rented a one-bedroom bungalow, which was really nice and nearby the RV site. Only downer was that the hot tub at the pool was not working, but the pool was nice. Also, there is only a very weak Verizon signal but the park's Wi-Fi worked, albeit very slow during peak times, kept getting cut off. Cable TV is provided, but channel selection is limited. Laundry, while small, was nice and clean, $1.75 per load for washers and same for dryers. We enjoyed our stay wad would return. We camped at Drifters Resort in a Motorhome. Really good seafood at Paradise Key Restaurant, a short drive from the park toward Rockport. Many great places to eat and a wonderful beach in Port Aransas, after a short crossing by free ferry. The Dolphin Encounters tour was really good, saw many playful dolphins. The Fulton Mansion is an interesting short, affordable tour, and a can't miss is the USS Lexington, about 30 miles away towards Corpus. Drifters Resort is a great resort in Rockport. It was immaculate while we were there. The grounds are very well kept as are the facilities. The pool and spa area were great and very refreshing during the day. The wifi was strong and reliable. They also provide cable but we were not able to connect as I didn't have a long enough cable. Our family also rented a bungalow and a cabana in addition to my RV site. Both cabins were very clean and they showed each day to replace towels and such. We stayed in site 53 which was a very level concrete pad with lots of shade. The power pedestal, cable and water connections were in the very back of the site. The sewer was centered. The was very little grass at the site due to the high shade. I will take shade over grass any day when on the Texas coast. My only issue was the rule of not allowing dogs in the yards of the cabins. I understand with not allowing them in the buildings but not in the yard? We had rented two cabins and an RV site. We wanted to use the yard area from the cabins to spend our time together as a family and by not allowing us to keep a dog in the yard was disappointing. The web site clearly says no dogs allowed in the buildings. Its say nothing about not being in the yard. There is a sign on the inside of the cabin door ( I didn't rent a cabin personally, I rented an RV site) stating no dogs allowed in the yard. A workamper came by on a golf cart and asked me (he was polite about it) to remove the dog from the area and return him to the RV. Again this was disappointing to me as a dog owner. Overall for the price the park is a great value on the RV sites. 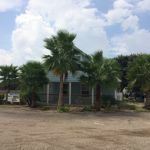 Its very clean and well kept and convenient to both Aransas Pass and Rockport. We camped at Drifters Resort in a Travel Trailer. We ate at the Paradise Key Dockside Restaurant in Rockport and really enjoyed it. The view is great and the food is better!! The pictures are beautiful and parts of the park are just not most it because the grass has died. Our site was long with lot of width under very old oak trees. Although the site is wide it is a very narrow path between the branches to park the unit. Most of the sites are taken by full timers so for them this is no problem. The park has NO pull thru's. The water and electric are at the back of the site I had just enough hose and power line to reach the utilities. The sewer is in the middle and is no problem. Because of the trees no satellite is possible. The bathrooms and pool area are nice and the wifi was good (poor AT&T reception). On the way out I went the way that was directed and hit the bottom of some branches no harm but annoying. We would stay at a different park next time. We camped at Drifters Resort in a Motorhome. We where there during Sand Fest (sand sculpture contest) it was a blast. Also a trip to the Lexington Air Craft Carrier is worth the time. At the National Seashore was nice and got to see a turtle which was cool. We tried numerous restaurnts and did not find a good one, maybe just bad luck. All roads are paved. Sites are concrete and level. Many mature trees. Sites accommodate large rigs. Nice pool, exercise room and laundry. New rec hall with lots of activities for winter Texans. Staff are all polite and professional. Wi-Fi is very iffy. Cable TV has good reception. No phone service unless you go to the main office parking lot. Biggest con: cats. Lots of cats running loose and management advised they are neutered/spayed and fed by employees. Lots of cat fights at night. Other than the cats, park is very quiet. We camped at Drifters Resort in a Fifth Wheel. Close to Port Aransas beach. Lots of activities in the area. I stayed at this park for one week and would have loved to stay a lot longer!! The nicest RV park I have ever stayed at. The managers and staff, super nice!!! They fulfilled our request for a place to leave our mobile photography studio trailer with no issues....sometimes it IS a pain but not here!! There is no restaurant but the hamburger stand they run out front is beyond awesome! Loaded with trees but still easy to maneuver and green grass on all the sites we saw. As we have a very small rig, my request to be placed close to bathrooms was not a problem. Laundry was nice and clean. They have a pool and an exercise room with the most amazing equipment...nothing cheap or broken down here! We camped at Drifters Resort in a Truck Camper. Charlotte Plummer's Restaurant-Family eatery where the food is fresh and always delicious! ($-$$) As campers know, a good grocery store is always a plus....I love our HEB!!! For the best fishing supplies and appropriate clothing to remain comfy in the humidity, check out Tackle Town!!! Rockport Beach is not like all the other beaches you've been to...find out why! Don't forget to make a trip across the bay from Aransas Pass to Port Aransas...by ferry!!! Rate reflects 7 day stay. 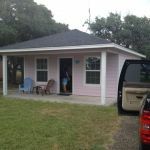 Normal weekly rate is $175 but was $225 during our week due to SeaFest in Rockport. Sites were excellent - shady, concrete level pads with full hookups including Wi-Fi and cable. We would definitely stay here again. We camped at Drifters Resort in a Fifth Wheel. All sites are concrete, large, and have room for the picnic table as well. We were parked under some beautiful oak trees and there is a lot of space between sites. All of the hookups worked well, including cable tv. Wi-Fi was more than adequate. Their laundry room is large, clean and reasonably priced. The exercise room is very nice, and the pool and hot tub look brand new! The women at the front desk are all very personable and helpful. We would come here again if in the area. We camped at Drifters Resort in a Motorhome. Super nice park. Very friendly staff. Nice sites. We could only get in overflow, but from what we could see of the sites, they are really nice, wide, concrete. Only demerit was one of the laundry rooms was small. We would stay again. We camped at Drifters Resort in a Motorhome. Very clean park. Price is for 4 adults. The park has a lot of seasonal sites but all are very well kept up. The restrooms are very clean but there is only 1 toilet in each, and 2 showers. There was a clean laundry room and the machines look new, but we didn't use them. There is a fitness room and a nice pool. Also a room with a pool table and tables for card playing. The park is about 15 minutes from Fulton Harbor and 40 minutes from Aransas Wildlife Preserve. We would definitely stay here again. We camped at Drifters Resort in a Travel Trailer. There is not one bad thing to say about this resort. It is one of the best in the area to say the least. The owners and office staff are the best and go out of their way to help you. There are so many activities. If you get bored here, you have a problem. Book early as they fill fast. We enjoyed our stay here and hope to be back! We camped at Drifters Resort in a Fifth Wheel. Nice park close to Rockport. Easy in and out. Sites are large. Pleasant helpful staff. Would stay here again. Weekly rate works out a lot cheaper at $175. We camped at Drifters Resort in a Motorhome. We lucked out and got a spot at this campground. Paved/gravel roads and cement sites and patio. The campground was full of very friendly winter Texans (Wisconsin, Michigan, Minnesota, Iowa etc folks). A lot of activities were offered. The only negative was that WiFi in our spot was iffy at times and Verizon cell phones did not work at the site, we had to walk close to the office to get reception. We would definitely come back to this well maintained campground and great office staff. We camped at Drifters Resort in a Fifth Wheel. We stayed here for the month of January 2014. We were greeted by very friendly staff. Also were escorted to our site which was the second one on the right as you come in the main road. This was a good thing to get escorted as the lots are filled with very low branches of live oak trees. The lots at the front get decent internet but not as you get further into the park. Cable type boxes are required to get TV. It was very cold this year and the pool was empty. Laundry 1.25 per load. Noticed someone putting dog bed and blankets into the machines..no designated machine for it. I have allergies. Also heard workers leave very early mornings from adjacent park. Very noisy. Air boats also noisy leaving early in the mornings for duck hunting. Had many sleepless nights. Not much happening in the park itself. New hall and out buildings are very clean. Find your own fun things to do. Shopping is Walmart and HEB for everything or you had to go all the way to Corpus. Ferry over to Port Aransas is nice..watch for the dolphins. Can't park on beach without permits. Not enough there to make me stay again. We camped at Drifters Resort in a Fifth Wheel. Are you affiliated with Drifters Resort ?